As this is our last blog, I have been thinking about the critical dilemmas we explored this semester. For me it all comes down to agency, especially with the idea of representation from this last unit. Agency is complicated by every other dilemma (for example: representation, identification, agent, etc). I want to use these concepts to really understand how agency was affected by representation and diaspora in Up the Yangtze. It is time for me to really attempt being a rhetorical theorist. I'm beginning to understand that representation is, basically, "...the use of one thing to stand for another through some signifying medium" (Bedford Glossary 438). In the case of Up The Yangtze, the river serves as this signifying medium--medium that is used to represent the social stratus, a factor of the tourism industry and even the economic boost of China. Gross, right? 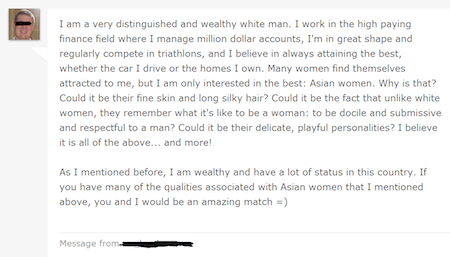 Whether or not we think this man is a real agent, his profile shows he is operating on a paradigm that he has of Asian women and clearly missing the mark. Who would be flattered to see other women get cut down for not being the right race while being lifted up for something that they can't control? Furthermore, he's acting like all Asian women are like this, thus preventing any dialogue by Asian women from occuring. Burke would say that this is a result of terministic screens: saying that he had gained this viewpoint through a world that had granted it to him. Sue Hum might say that this objectification is created intentionally to cast people in roles. Did the world create this gross guy or did this gross guy create the world? Last Summer when on a cruise in the Bahamas, my boyfriend of the time struck up conversation with out housekeeper. As selfish as it sounds at the time I wish he hadn't. She was from the Philippines and the mother of two children that she hadn't seen in five years. She took the job on the cruise line because there were no opportunities for her there. While this film was specifically about Chinese culture; it instantly make me think of that moment. On the cruise they have this obnoxious display where each staff member waves a flag of the country they are from. The ceremony takes about an hour since the nationalities of the staff is so diverse. No one really watches it. Its uncomfortable. Cringeworthy even. The pain from it comes from the fact that many of these workers have similar stories to that of our housekeeper. After speaking to more and more staff members; we sadly began to realize this was a norm. While the tourism industry presents itself to be about family; those who are making the experience meaningful are forced to be away from theres for years. Are You Who They Think You Are? How do you look to other people? Do you think you are fairly represented for the unique individual that you are? Or are you thrown carelessly into a mess of misconceptions based on external characteristics? Surely, no one is exactly as they seem. There will always be a part of you that is hidden from view, unobstructed by the judgments of others. But unfortunately, many look at the whole picture without taking time to appreciate the beautifully intricate details that are woven together that form who we are. So, is it our fault for not being completely forthcoming about every aspect of who we are as a person, or are we simply the victims of the never-ending battle of misrepresentation? The task of trying to represent another person in any form and any medium will always fail. The paradox I thought of the most while reading "Terministic Screens" is the chicken-egg question. Is our reality constructed by our symbols and language? Burke claims "much that we take as observations of "reality" may be but the spinning out of possibilities implicit in our particular choice of terms" (Burke, 46). So, what does that mean about representation? As Butler points out, "representation is the normative function of a language which is said either to reveal or to distort what is assumed to be true about the category of women" (Butler, 2). For some reason, our society is obsessed with labels. It's as if you don't know who you are unless you are labeled, categorized, or represented by some sort of symbol. This blurs the line between what is real and what is represented. While Burke claims that man is attached to a verbal realism, Butler insists that "instead of self limiting linguistic gesture that grants alterity or difference to women, phallogocentricism offers a name to eclipse the feminine" (Butler, 16). We represent others based on looks and abilities--how they present themselves to others. You are representative of a type of person. For example, if I am a white female, 21 years old attending a University, I am representative of this dynamic, reflecting back on "my" group of people and their characteristics, so you can imagine that most people already have assumptions of such different groups based on other people they have met or seen. “Up The Yangtze” offers stark documentation of tough times and new hurdles for families in ‘modernizing’ China during the construction of the famed Three Gorges Dam. Focusing on those displaced by the mega-hydroelectric dam that will eventually destroy their homes, farms, and arguably, culture, the film follows the lives of the relocated and their children, putting a face to the displaced Chinese locals that have long inhabited the riverside, as well as the economic futures of their children. I liked when we were discussing Up the Yangtze in class the other day and we arrived at the concept of privilege. We spoke earlier in the year about understanding the world around us through metaphors, in terms of other things we can relate or identify with. I believe that privilege functions as a barrier to identification or understanding between different groups created by class. After reading George's article on Helen Keller and Burke, and after watching the film Up The Yangtze, I realized that there will always be a bias when something, or someone, is being represented. It is inevitable. It cannot be helped. So then what representations should we believe? Which should we discard or investigate further? I have to admit, at first I was a bit skeptical about Yung Chang's documentary Up The Yangtze only because I had no idea how on earth he could make this subject matter interesting to any spectator. However, after work on Monday night I came home and watched it in its entirety and was completely blown away not only by the Three Gorges Dam that is portrayed in the beginning, but with the story of Cindy and Jerry. The main idea I got from watching this documentary that ties perfectly with what we discussed in class is the idea of representation. The way in which Yung Chang represents each of the protagonists in the film is different and that is so the viewers can get a better idea of what it's like for people working on this cruise ship on two completely different spectrums. On the one hand, Cindy is a young girl who unfortunately had to leave her home to have to work on the cruise ship in order to make money for her family. For Jerry on the other hand he willingly goes on the cruise ship simply for more money in his pocket. This is one aspect of the film which I enjoyed the most. Depicting these two completely different lifestyles is in fact important, not only to the storyline of the film itself, but for us as the viewer to get a better insight into the main point the director is trying to come across. Having this job is a necessity to everyone in this country, regardless of the reason their working there in the first place. I’m continuously fascinated by the texts that we are assigned to read for each unit. It’s interesting for me to see how these texts can be related to our unit in ways that don’t seem obvious on the surface. It shows me how much rhetorical theory is used around us. It’s in everything; every film, book, speech and piece of art is saturated in rhetoric. Though I've compared Burke's overarching philosophies to Butler's, his terministic screens seem to parallel with her theories more than his others. Butler is concerned with the construction of gender. She asserts that feminist theory assumes this category of identification of "women," a terministic screen that "either reveals or distorts what is said to be true about the category of women" (Butler, 2). Here we will observe how Burke's problem with representation - his idea that our symbol systems create our reality, construct the subject, and fundamentally direct the attention to something specific rather than the whole - how his ideas present a direct parallel to what Butler is saying about women in a gendered world, and what kind of problems this presents for representation. As Chang is of Chinese heritage but a Canadian citizen, relevant intertextuality can be considered. Chang mentions his Grandfather, thus establishing his family history as one text. The less historical and more recent China shown in the film is another text, which is juxtaposed with the former; old vs. new China. Within the film, a metaphor is used to explain China’s socialist intentions but capitalist realities, this is another dichotomous juxtaposition. Consider also the varying audiences; representation of one’s personal culture within the film might also be a text. The film has been translated into many languages, and a few nationalities are shown and discussed on the boat. As an audience, we were invoked (Ong) to play the role of tourist, as exemplified by the tourists on the boat. But we are also another audience, one that is specifically addressed when Chang includes voice overs. At the same time, Chang might be invoking us to not be exactly like the tourists, to have a greater awareness of the complexity of the identities of those involved. The film Up the Yangtze attempts to show representation for the culture and country of China. In an attempt to show how tourism, development and upgrades are benefiting the country as a whole and the people within it, the film also contradicts itself when it shows how these developments can also negatively affect the people of China. It is the dawning of the Millennial’s and the old heads couldn’t be more terrified. From a purely architectural standpoint, the Three Gorges Dam is an impressive feat of human engineering. The dam spans almost 8,000 feet in length and has a height of about 600 feet. In terms of capacity, the Three Gorges Dam is the largest hydroelectric power station in the world. If the above facts were all you knew about the Three Gorges Dam, you might be inclined to agree with the Chinese Government that the Dam is a triumph. However, if you watched the documentary Up The Yangtze, you might reconsider. The human cost of the Three Gorges Dam is startling: almost 1.3 million people were forced to relocate as construction of the dam led to rising water levels. The juxtaposition in Up the Yangtze is very evident in many places in the film as discussed on Tuesday. People, places, lifestyles, images; everything is juxtaposed at one point or another. But this juxtaposition is done for one reason: perspective. When we want to look at a movie in a certain way, we have a preferable way to look at it. For instance, some people may want to look at the film through the young girl's eyes. This would show that they are sympathetic to her situation and want to share in her struggle. Other people may want to see the film from the 19 year old boy's perspective. He is much more easy to identify with for us. He comes from a family that is well off. He can go to a school to get an education like we do currently. His choice to work is his own, which I have done before. Perspective is everything. It affects our stance on different pieces of history or media. If we all had the same perspective, there would be nothing to unpack about anything. We need these perspectives to articulate different situations for different people. Analogies were always one of my strong suits in elementary school, so here’s one for you. Helen’s language barrier is to Cindy’s past and lower class status. They are factors of disadvantage that held them back in ways others could not fathom. It is true that these two eventually prove wrong those who judged and pitied them at first, but there were countless struggles before Keller was able to recreate her technique for language and before Cindy became accustomed to working in a place where she knew no one and was forced to accept, even glorify, a new culture. Is Representation Doomed from the Start? Perhaps all representation is doomed to fail. It is a troubling idea, but seems possible, and even inevitable. Perhaps the hegemonic underpinnings of representations in their most basic form, language, prevent us from ever truly achieving objectivity in representation. That seems to be the aim of representation, after all. Accurate representation is objective truth. But perhaps this is unachievable. If this is all true, how are we to function in such a world? Is representation ever truly possible? Yung Chang's Up the Yangtze documents the changing dynamic of communities that are to be affected by the renovation of the Three Gorges Dam. He depicts the issue through the lives of Cindy and Jerry who work on a Western styled cruise ship that travels up the Yangtze to the dam. This documentary presents some issues with representation. It makes me question who is being represented in the film, who is being represented by China, and the choices Chang makes in representing this issue as a whole. What is made so clear about Up the Yangtze is the clear class distinction there is in China and what the Western perception is of China. For a technologically advanced and green project with the hydroelectric dam, China has its fair number of people who are poverty-stricken. In the film, there is a true representation of the poverty-stricken. From looking at the film Up The Yangtze, I realized that I could not have been able to be in that situation and survive happily. It seemed like it was a very sad situation to be a part of. For instance, being forced to move out of my house because of a flood is fine. However, not knowing where I'm going to go next is another problem because if there is a flood happening my family and I would still need a place to stay that is safe. Putting myself in that situation there is no way I could have done that and not raised holy hell or argue for someone to find my family a safe place since we were being kicked out. This all goes back to how these people were raised. It's not as if they were raised in America and then had to live an extremely rough life style from here on out. There was no adaptation; she was born into that life style therefore she does not know what it feels like to be treated a better way versus a wrong way. This is honestly the only way to be treated for her . I feel as if I can connect more to the 19 year old boy because he is at least trying to make a living out of something. Granted he comes from a prosperous and wealthy family he is still trying to make something out of himself as opposed to just living off his family. I am more so that type of person because even though I know that my family will give me want I want I still feel the need to become independent and at least try to get my own. Realizing this is a nineteen year old boy I wonder if I was in his position being a girl would it be looked as "wrong". I know in many parts of the world it is still looked at as an irregular thing to have women act independent as if they don't need the man. It is almost as if women must do what is expected of them and nothing else; going over and beyond and achieving goals that women aren't supposed to is not even congratulated. I don't mean to come off as a feminist but just imagine or even think about Up The Yangtze for a good example. Coincidentally the girl is the one who is kicked out of a home along with her family and the boy is making a living while he has a prosperous family who is willing to give him money. I honestly feel as if the girl was to switch places with the boy she wouldn't be as successful as him in singing or porting. Not because she is incapable of doing these two thing but because not many people would be in favor of her doing so. This also ties in with Helen Keller as we talked about her last week. Many people just knew right off the back that she wasn't able to live life the same for two reasons. One of them being because she lost her sight and hearing and the other reason is because she is a woman. Most men already feel as if women are weak because we are not physically stronger than men ,which may be true; however I feel as if Helen Keller proved everyone wrong. Although she did have to be taught different ways to communicate with others, once she learned how to do so she progressed and lived her life to the best of her ability. She did not dwell on the fact that she was different from others, she moved forward as she should, nothing was going to change. All in all this proved to me that women most certainly are stronger than men in all ways. I am awaiting the day that men and women are put on the same spectrum in all aspects of life. Course blog. Please do not adapt assignments, or cite text or content without permission. Simple theme. Theme images by gaffera. Powered by Blogger.